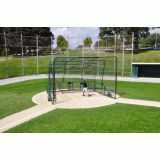 Motorized retractable baseball batting cage. Easily raises and lowers from the ceiling using a drive shaft powered by a 1 HP electric winch, key switch operated. Size is 10'H x 12'W x 70'L. Frame is constructed of heavy walled 2" aluminum tube. Net included. To complete your installation, order one of the ceiling mounting kits. 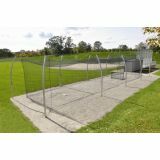 *14' wide cages also available, call Jaypro for details. The #1 style for Spring Training Camps! Designed for semi-professional and collegiate use. Standard features include: Size is 18'W x 22'D x 12'H. Constructed of 2" heavy wall aluminum tubing. Easy to fold and collapses to just 5' high. Frame features handy strut holders too. Coaches rear safety railing for safe viewing. Enhances your unit with the optional coaches stand. Transports easily on three 16" pneumatic turf wheels. Black heavy duty #42 climatized nylon net. 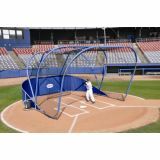 Includes heavy vinyl coated nylon skirt that protects the metal frame and gives the pitcher an attractive visual backstop. Rear net baffle reduces wear and tear on net and skirt. 60' of ricochet cushion reduces rebound and frame damage. Standard Features Include: Size is 16'6"W x 16'6"D x 12'H. 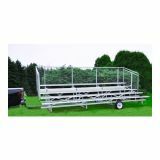 Fold's down to 48"H. Constructed of 2" flo-coated galvanized steel with green powder coat finish. 16" pneumatic wheels. Oversize rear wheel cranks and swivels for easy mobility. 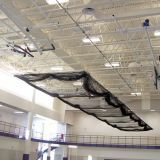 Includes heavy duty, #42 knotless nylon weather treated netting with rear baffle. Includes 18' of ricochet padding. Jaypro Exclusive! Patent Pending locking quick release safety strut clamps prevent inadvertent and dangerous release. Skirt and additional ricochet padding available separately. 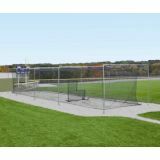 Designed for collegiate or high school use, this portable batting cage offers many of the features of the Grand Slam but at a more competitive price. Standard Features Include: Size is 17' 6"W x 12'D x 12'H. Constructed of 2" heavy wall aluminum tubing. Transports easily on three 16" pneumatic turf wheels. Black heavy duty #42 climatized nylon net with rear baffle. Jaypro Exclusive! Patent Pending. Locking quick release safety strut clamps prevent inadvertent and dangerous release. Optional vinyl skirt (available separately) protects the metal frame while giving the pitcher an attractive visual backdrop. 24' of ricochet cushion reduces rebound and frame damage. Features include: Size open: 18'W x 22'D x 12'H, folded down: 18'W x 12'D x 5'H. constructed of heavy-duty 2" Sch 40 aluminum tube. 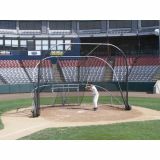 Black heavy duty #42 climatized nylon net with rear net baffle. 4' x 6' x 4" thick thud pad, vinyl skirt and standard black ricochet padding on all overhead framing. dual coaches' stands with leaning bar that also serves as a convenient strut holder. locking quick release safety strut clamps; swivel side wheels that lock into position; rear wheel handles that can be lifted or lowered to move cage.